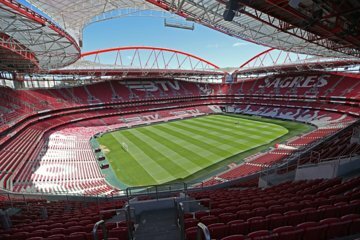 Appello a tutti gli appassionati di calcio, sfrutta al massimo il tuo tempo all'interno del Estádio do Sport Lisboa e Benfica in un tour di 3 ore con servizio di prelievo e rientro in hotel a Lisbona. Al mattino o al pomeriggio orario di partenza, viaggia verso lo stadio in un veicolo con aria condizionata e parti per un tour per gli spogliatoi, posti a sedere dei dirigenti e il campo. Vedi anche, più di 20.000 mostre dedicate a SL Benfica, una delle principali squadre di calcio portoghesi, al museo dello stadio. A seconda dell'orario di partenza selezionato al check-out, incontrerai il tuo autista presso il tuo hotel di Lisbona alle 9:00 o alle 12:30. A bordo di un veicolo con aria condizionata e riceverai una panoramica del Estádio do Sport Lisboa e Benfica, che ospita la squadra di successo SL Benfica. Potrai fare un tour completo dello stadio: assorbi eccellenti viste sul campo dai posti a sedere dei dirigenti, vedi le maglie di famosi calciatori nello spogliatoio e sali sul prato incontaminato del campo. Nel museo, vedrai oltre 20.000 reperti che parlano del prospero passato e presente del Benfica. Dopo aver finito, torna al tuo hotel in un veicolo con aria condizionata. Very good guide. We were picked up at our hotel at 9:00 am - took about 25 minutes to get to the stadium. However, we were not allowed into the stadium, per their rules, until 10:00 am. We wasted 40 minutes outside waiting. Inside the Benfica guide was good, disappointed that we were not allowed access to the home team locker room, only to the visitor locker room. there is also a huge museum and we were directed around by our guide for too long. We could have used less time there. He was knowledgeable but we did not want all that time there. Next time - cut the tour shorter by an hour and coordinate transfer time to/from the stadium. We were picked up directly from at our hotel promptly at 9:00 am. Our guide was outgoing and nice - english very good. He was training a new guide, which was fine. It ended up our tour was just the 4 in my party, which was nice. the the transfer to the stadium was about 20 minutes, we arrived at the stadium 40 minutes early and we could not enter. We had to wait outside - which was a wast gif time. Inside, the benfica guide was good, disappointing we were not allowed access to the Benfica locker room, only the visitors locker room. Th tour within the field/building was nice. But here is a huge museum as well, and our guide spent too much time there. I would have preferred to simply walk through - this made the tour too long. Next time they should chop an hour off the tour. And coordinate the departure time from the hotel. We were all antsy at the end and just wanted to be done. I booked this tour primarily for my two boys aged 18 and 13 who are football crazy. They loved every minute of it. It was very convenient getting picked up at our hotel and taken directly to the stadium. Our guide Paulo was excellent: he arrived early and made our tour very relaxed, informative and enjoyable. Paulo stayed with us throughout the tour but the stadium had its own expert on Benfica and she explained the history and gave us a great tour. Paulo then accompanied us to th museum where he was able to smoothly signpost the displays of most interest. I have visited Barcelona's stadium, without a guide, and I think this experience was better overall. The immersion experience in the elevator is not to be missed. We were dropped off at the hotel and the boys and I were delighted with the overall experience. The whole package took around 3 hours.